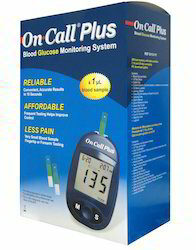 We offer diabetic care products which people can trust to help them monitor diabetes. For the determination of blood glucose using the following glucometers. 2. Accu-Chek Performa Nano Glucometer. 3. Accu-Chek Performa Connect Glucometer. 4. Accu-Chek Performa Combo Glucometer. 5. 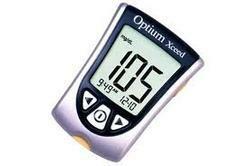 Accu-Chek Performa Expert Glucometer. 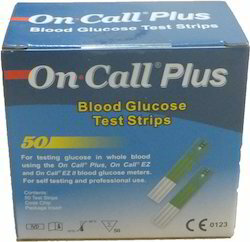 We offer On Call Plus Glucometer Strips which is compatible with both ON CALL PLUS GLUCOMETERS and ON CALL EZ GLUCOMETERS. Easy to handle and hold. Available in 25,50,100 and 200 strips pack. Available in 50 T packs. Quick visual check for additional safety: (= stabilitycheck)The round control window on the back of the test strip must not differ from the reference colour "0" on the colour scale on the test strip container. If the round control window has turned a different colour, the test strip is unusable and should be discarded. Easy to handle:The large size of the test strip itself makes it easy to grasp, hold, insert into the meter and discard. Flexible - thanks to out-of-meter dosing and AST options:The Accu-Chek Active test strip can be dosed outside the monitor. This and the fact that only1-2µL blood are required, make AST testing comfortable and convenient. 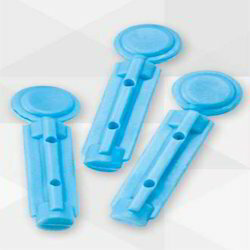 We offer excellent quality sterile Plastic Blood Lancets (Twist Type). Our lancets are compatible with major lancet devices. Available in 100 Nos Packsize. For testing Blood Glucose Level Usine Abbott Freestyle Optium NEO H Glucometer. 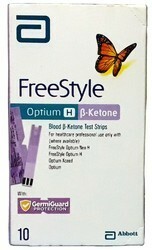 FreeStyle Optium β Ketone Test Strips for self-testing your blood ketones. Compatible with the FreeStyle Libre system, FreeStyle Optium and FreeStyle Optium Neo blood glucose meters. Available in 10 Test packing. 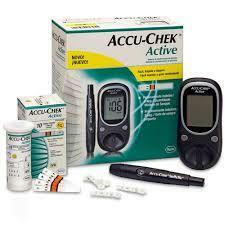 Features Model: Accu-Chek Active(Model GC) Measuring Range: 10-600 mg/dl(0.6-33.3 mmol/L). Sample Size: 1-2 µL (1 µL (microlitre) - 1 thousandth of a milliliter) Measuring time: Approx 5 sec if test strip is in meter when applied (depends on concentration). Approx 10 sec if test strip is outside the meter when applied (depends on concentration). Power Supply: 1 battery (type CR 2032) Battery life: Approx. 1000 tests or approx 1 year. Automatic Power-off: After 30 or 90 seconds depending on operating status. Memory: 350 test results with time and date, as well as 7,14 and 30 day averages Temperature During testing: +10°C to +40°C During storage: Without battery -25°C to +70°C With battery -10°C to +50°C Atmospheric humidity During testing:up to 85% relative humidity During storage: up to 93% relative humidity Altitude: sea level to 4000 m Weight Without battery: approx 55 g With battery: approx 60 g Data transfer: Via infrared interface (wireless). Automatic coding: Via reliable code chip. Warnings: Strip expiry warning, thanks to reliable data stored in the code chip. 2. AST (Alternate Site Testing) to test on areas other than your fingertip. 4. 5-second test time for glucose testing. 5. Display light to assist in low light testing. 6. Large screen for clear and easy to read results. 8. Displayed averages of 7, 14 and 30 days. 9. Large memory of 450 events. We are amongst the most reputed names in the industry, offering Abbott Blood Glucose Meter. Looking for Diabetic Care Products ?